There has been a recent flurry of birth stories in the media. The mothering magazine Brain, Child published two essays about What Defines a Good Birth, and earlier this month Randi Hutter Epstein wrote a piece called The Lore of Labor for the New York Times. I started thinking about what constitutes a good birth. Every mother on earth wishes for a happy and healthy baby. But what happens if the baby you birth isn’t healthy? Does that mean you’ve failed as a mother in your very first task of motherhood: giving birth? Babies are born early. Babies are born with medical conditions. Babies are born needing surgery. Babies are born with disabilities. These outcomes are rarely discussed in the world of expectant mothers. Sometimes the baby who pops out is not the baby we expected. This is our first early lesson in motherhood. As all children grow up, they surprise us, they shock us, they sadden us. We generally learn these hard lessons gradually, when they are teenagers. But for some of us, this is taught very early, as we blink back tears in the delivery room. This is difficult to process so early on in our journeys, as we grapple with raging hormones, sleep deprivation and shock. But process it we must. We have not failed; we’ve been turbo-boosted into the imperfect world of motherhood. We must now get to the work of loving our child. We have no choice but to begin serious mothering when we have just freshly given birth. For we all love our children, no matter what. Your 3 month old won’t sleep? Your toddler is screaming in the grocery store? Your 11 year old is failing math? You do not stop loving your child. Your 9 year old acquires a brain injury in a car accident? Your teenage daughter has an eating disorder? Your 23 year old struggles with addiction problems? You do not stop loving these children either. Parenting is hard work, and that’s how it should be. We have not failed in birthing our sweet, soft babies. We are thrust onto the bumpy road of mothering when we are least ready for it. We are inexperienced and fragile. We find out early that there’s no such thing as perfect or normal. While most mothers bask in the innocence of their healthy children, we know different. The skills we acquire in those dark early days serve us well as mothers. We understand that stuff happens, and that things do not always go according plan. We carry that resiliency and flexibility forward into motherhood. 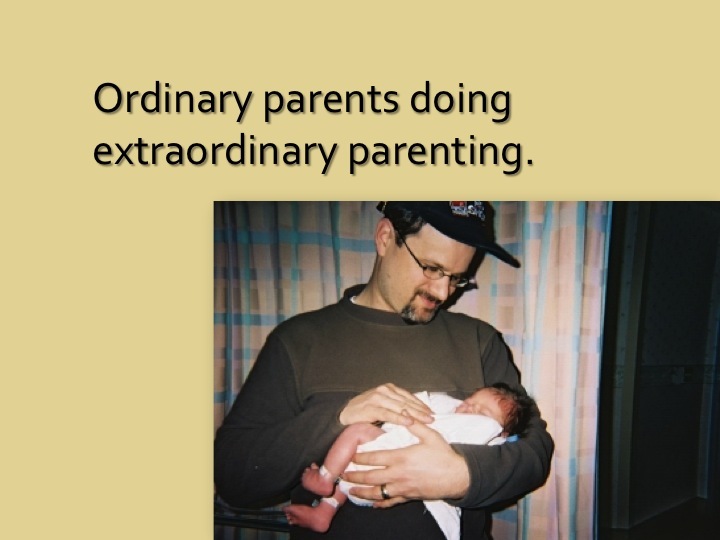 We are ordinary parents doing extraordinary parenting. And that doesn’t seem like a failure to me. What a lovely blog entry Sue. They sure do not come with a manual. Just last night my daughter made me cry because of her complete and utter fearlessness at age 5. She stood up and sang and danced in front of a huge crowd. She also almost died twice in her short life. Only now am I able to re-think some of those moments. I will be writing and sharing more of the messages of unexpected things during parenting. I do look forward to reading your writing, my friend. You are an awesome mom. It takes me back to 1999 when I was studying prenatal diagnosis of congenital heart disease and discovered the book, “The Worth of a Child” by Thomas Murray. He argues that “prenatal testing is a form of perfectibilism, the desire to escape the uncertainties and contingencies of human relationships” (p. 12). The good news is that “once we reject perfectibilism, we can embrace a conception of parenthood as the sustained effort to work out unmistakably human relationships, that is, relationships devoted to fostering love, dedication, and mutuality, in the face of ever-present imperfection, ambivalence, and disappointment” (p. 136). As the world wide web was emerging in 1999, I thought that an innovative title for an article would be: http://www.thewonder,worry,andworthofachild. The draft is in my files somewhere. Thanks for getting the message out. Thank you so much for the comment, Gwen. The phrase, ‘Ordinary parents doing extraordinary parenting’ comes from Gwen – I heard her speak at a heart conference a few years ago…and these words really resonated with me. The graphic is a slide that I use when I speak about family centred care and disability at health conferences (it is a photo of my husband and Aaron, who is about 5 minutes old) – thank you to Gwen for that inspiration!